MILWAUKEE, WI--(Marketwired - Mar 17, 2014) - Johnson Controls (NYSE: JCI), a global multi-industrial company with established core businesses in the automotive, building and energy storage industries, introduces a York® smart thermostat with Wi-Fi® capabilities. Wi-Fi allows homeowners to use mobile devices to remotely monitor their home comfort systems, enabling them to make energy-saving adjustments to system settings. In addition, reminders and alerts can be sent to homeowners to prompt servicing, potentially saving energy and preventing unexpected repairs. Homeowners can easily schedule multiple custom daily events and vacation schedules on their thermostat, as well as home/away settings on their smartphone or tablet device, for greater energy savings. Temperature and humidity notifications help to keep pipes from freezing and prevent mold. In addition, the advanced "Quick Heat and Cool" feature allows homeowners to temporarily "speed up" their system to the highest capacity to hit heating or cooling set points quickly. York's IntelliComfort™ mobile app gives homeowners access to the York® Affinity™ Residential Communicating Control system, providing remote temperature and humidity control for up to six separate zones throughout the house. The mobile display also allows homeowners to control more than one home, if necessary. The York Affinity Residential Communicating Control with Wi-Fi capabilities features a high-definition touch screen with easy-to-read icons. It also displays information in multiple languages, including English and French, and offers either Fahrenheit or Celsius settings. 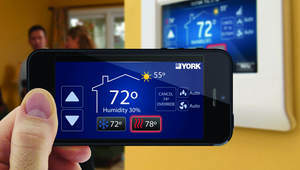 For more information about the new smart thermostat from the York brand of Johnson Controls or to find a heating and cooling contractor, visit www.york.com/smart-thermostat. York® products from Johnson Controls include energy-efficient, residential central air conditioners, heat pumps, furnaces and accessories and innovative light-commercial, packaged heating and cooling systems marketed through a national distribution network and delivered to home- and building-owners through qualified York heating and cooling dealers. For more information about York, visit: www.york.com. For the latest news from Johnson Controls Building Efficiency, please visit http://www.johnsoncontrols.com/benews and follow @JCI_BEnews on Twitter. Johnson Controls is a global diversified technology and industrial leader serving customers in more than 150 countries. Our 170,000 employees create quality products, services and solutions to optimize energy and operational efficiencies of buildings; lead-acid automotive batteries and advanced batteries for hybrid and electric vehicles; and interior systems for automobiles. Our commitment to sustainability dates back to our roots in 1885, with the invention of the first electric room thermostat. Through our growth strategies and by increasing market share we are committed to delivering value to shareholders and making our customers successful. In 2013, Corporate Responsibility Magazine recognized Johnson Controls as the #14 company in its annual "100 Best Corporate Citizens" list. For additional information, visit www.johnsoncontrols.com.